Another set of weave poles. A tunnel. Like a lot of dogs, Shiva is such a tunnel sucker. The only way I think we can fix this is by training around it. Dog toys, because after this week we won’t have any left! I can’t believe the Christmas season has arrived already. The music is playing in the mall and the decorations have been put up in every spare inch of the commercial district. I’m determined to get everything done early. Yes, I always say that but this time it’s going to happen. I vow. This year Shutterfly has been kind enough to offer a fantastic deal to bloggers. I’m hoping the fifty free cards they are offering will help me get a head start on checking things off my to-do list. Is it already too late for that? Probably. Anyway, you can find more about the giveaway here. I’ve never used the site before but after hearing about it from so many other bloggers I figured it was worth checking out. There are a lot of beautiful options. Typically, I just buy a box of standard, ie. boring, cards from Hallmark and call it good. Each Shutterfly card is unique and personalized. Instead of sending out the same dull cards that people on my list barely glance at, it would be nice to make this year a bit more special. Being so far away from all of my close friends and family members is particularly difficult during the holiday season. It would be nice to do something different. And with such cute pets who can blame me for wanting to show them off as often as I can? Some of these holiday photo cards are especially sweet. I think it will be fun choosing each one – rather than the chore it often ends up being. Especially when I leave it to the last minute. They certainly have a huge selection. Although, given my problems with decisions, that could be trouble. As I looked over the website I noticed how many different photo gift products they have. 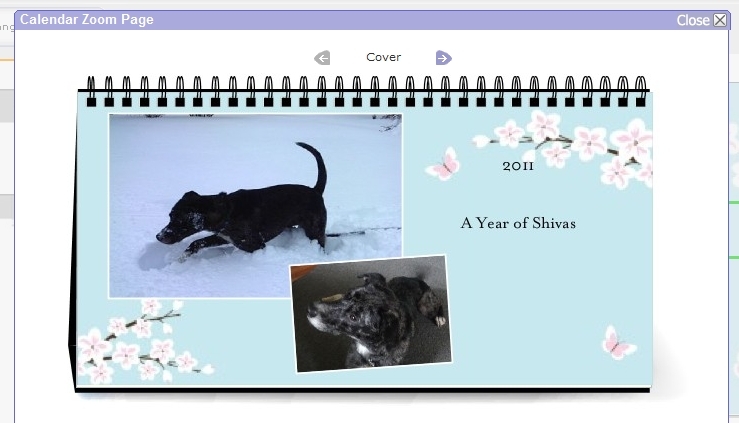 Any time of year, Shutterfly would be a great place to check out for personal gift ideas. I especially loved the desk calendars and am contemplating making one for myself. How adorable would this be on my work desk? Right? Anyway, it’s worth looking into if you are at all interested in loverly, personalized cards. I’m not sure how long the fifty-card deal is on for, but I’d check it out soon! Time does fly by! Before we know it, Christmas is already around the corner. I love those Christmas carols and decorations too. Hope all items in your wish list will be checked soon!!! Happy shopping!!! A week of sleeping in till eight!!! I want that so bad too!! I lived in MT for a bit not far from Canada. A northerner by heart, a now Midwest Southerner by location. Check out my friend Stacy’s online store and look for Muttens. http://www.buschpetproducts.com They are very warm, thick mitten like things which allow you to hold a leash while keeping your hand warm. I love them :). Eight o’clock? I work night shifts – I am glad to be home by that hour! HA. Those muttens? Those are awesome and EXCATLY what I need. My current fingerless gloves with the flap over do not provide me with enough warmth or the ability to reach into my pocket without taking them off. I am emailing the link to my husband right now. Thank you so much for recommending them! Seriously, finding good warm mittens is really hard for someone who’s hands are ultra-sensitive to cold. I can’t believe it’s that season again… It seems like it should only be sept! My sister-in-law gave me the cutest hat and mitten set. The hat is designed to look like an animal head, and the mittens separate to be fingerless gloves with a pull over mitten flap. It is so cute! We love! Shutterfly! Ryker has two baby books and we are working on the next edition. We have been making cards and other goodies for a couple years now…I will have to make a post and show some of the cool stuff we have done. You will have to show us what you come up with. Don’t know what an inverted spatula is. Been searching for gloves that would keep my hands warm and dry, but at the same time allow me to feel the lead. On Christmas Day I hope your list has many ticks. i have no idea what an inverted spatula or weave poles are but they sound interesting. christmas has come to australia too, in a blazing, muggy kind of way. it always amazes me how the decorations and sales come out earlier and earlier each year. sometimes, the tinsel and trees pop up before the pumpkins, which i suppose is to be expected since we don’t really do halloween. Since my husband and I are looking to downsize our housing and possessions, this Christmas is not supposed to feature any gifts that aren’t consumable. That’s why the only things on my list are dog toys. Honey’s not as good a chewer as Shiva but still, the toys are eventually consumed. I’m looking into the card deal first thing in the morning. I’m too tired tonight to be making any decisions. I couldn’t believe it was nearly Thanksgiving, but this is all working in my favor as we are now so much closer to summer break. I was thinking of making some dog cards, so I might have to check Shutterfly out. First, your Shiva is so freaking cute. Second, I love your book list. I’ve read several of the selections on it, but may I make a special plug for Lost Dogs? I just finished it, and though the first 60 pages are VERY difficult, it is a beautiful book on the balance. Enjoy!